I was asked a month or so ago for a top tip on overcoming nerves when speaking in public. I immediately responded with a one word quip … “breathe”. Then I thought about it! Apart from it being essential to life, a good belly breath in and a good belly breath out centres your body and helps to anchor your mind. It adds quality to your voice projection. For maximum control of your breathing stand straight, knees slightly flexed, head straight and shoulders back. The deep breath allows you to project your voice to the back of the room. When you breathe steadily you maintain control of what you are delivering. This has a calming effect on the listener. It allows the audience to take in what you have just said. What’s more, a pause for breath will save you from uttering an irritating um or err or stammer. It is easier to breathe when you use short sentences. Grammatically when you write, you add in commas, semi colons, colons and points to indicate an intake of breath. When you converse you tend to do it in short sentences combined with linked words such as and or but. In public speaking short sentences that are not linked deliver a much more powerful message. The audience imagines the linking words. 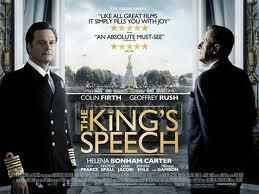 We only need to watch The King’s Speech to recognise the power of the short sentence and the pause for breath. This is the effect! This is King George’s Real Speech. I also like Kate Bush’s Breathing but it doesn’t sit quite right with the article so I thought I’d add it as a post script!